1. Make orange hollandaise: Melt 1 stick butter in a small pot over medium-low heat. In a blender or food processor, blend orange juice and zest, lemon juice, egg yolks, cayenne, ½ teaspoon salt and ground black pepper until combined. With motor running, slowly pour melted butter into blender and continue to process until sauce emulsifies and thickens. Add more salt or lemon juice if needed. Set sauce aside. 2. Add the following to a large lidded pot: 4 cups water, wine, vinegar, whole peppercorns, 1 tablespoon salt and bay leaves. Set a steamer into pot, making sure not to let steamer touch water. Bring liquid to a simmer over medium heat. Reduce heat to low, then carefully lay salmon into steamer. Cover pot and steam salmon until it flakes and just cooks through, about 7 minutes. Remove fillets from steamer and set aside. 3. Meanwhile, add ½ cup water and remaining butter to a large sauté pan over medium heat and bring to a simmer. Add Swiss chard leaves and sauté until tender, about 5 minutes. Season with salt. 4. To serve, divide Swiss chard among 4 warmed plates. 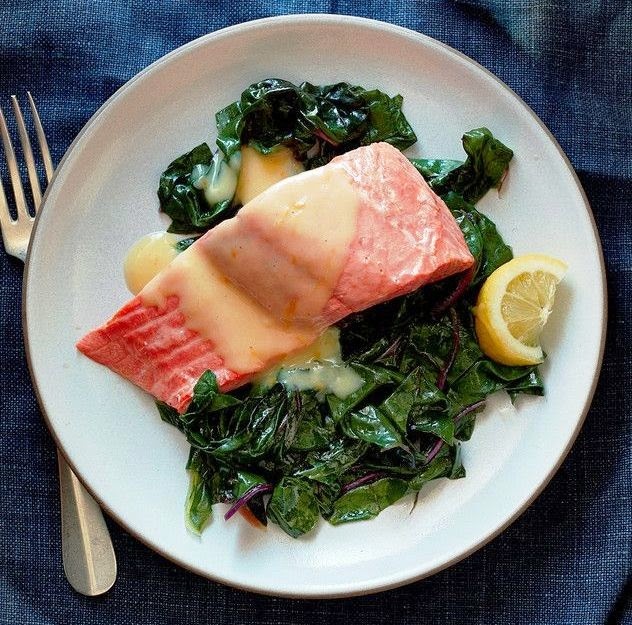 Place one salmon fillet over each portion and drizzle orange hollandaise over top. Garnish with a lemon wedge.